There is no getting around it. If you decide to give these a go you are going to get your hands dirty – or at least chocolaty. The first step is to make a coffee flavoured ganache. Once it has a chance to set, you need to roll it into balls to make the centre of the truffles. Once the balls have hardened sufficiently, you need to coat them in chocolate. 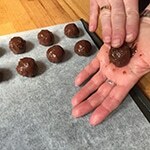 The quickest and easiest way to do this is to literally dip your fingers into molten chocolate, pick up the truffles and roll them on your fingertips to coat them with the chocolate. If you have tempered your chocolate (see below), the first ones will have set by the time you have finished them all and you will be able to give them their second coat straight away. Word of warning though. 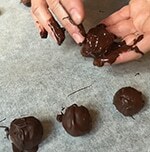 Don’t be tempted to lick your fingers at any time until you have finished coating all the truffles, as any moisture will cause the chocolate to seize and become unusable. And that’s beside the fact that it’s not good hygiene practice to be licking your fingers anyway. If your hands become too chocolaty and you stop part way through to wash them, make sure you dry your hands completely before continuing. If you really don’t like getting your hands dirty you could use a dipping fork to dip the truffles into the melted chocolate. This is a bit slower though and it is a little trickier to get that nice ruffled finish. 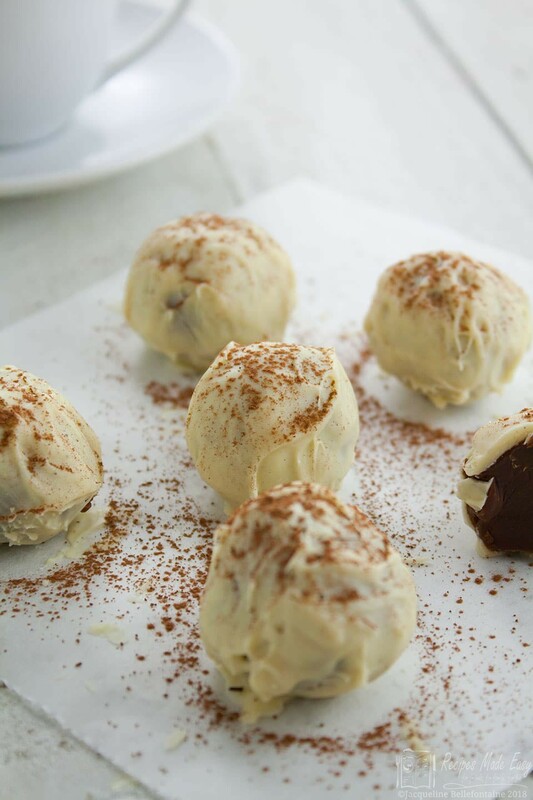 For a perfect finish, these coffee truffles are coated in tempered chocolate. Tempering chocolate is the process of heating and cooling chocolate so that it sets to a crisp shiny finish. It gives chocolate that characteristic snap as you bite into it. Untempered chocolate has no “bite” and may develop a bloom (spotty dull white colour) which spoils the appearance. The easiest way to temper chocolate is by following a process called “seeding.” Melt about two-thirds of the chocolate slowly over a low heat. Once it is melted, add the remaining chocolate and stir until it melts. This will cool the chocolate and it will begin to thicken slightly. It is now ready to use. I was lucky enough to watch well known chocolatier Paul A Young demonstrating tempering chocolate on a marble board. This is the traditional method, but not easy and potentially very messy. However, I did come away with one very useful tip: NEVER hurry the melting process. You can even leave the chocolate melted for several hours before beginning the cooling process. Although you might not want to leave it that long, it is essential that you let the chocolate melt slowly. Place the chocolate in a bowl over a pan of hot water, making sure the water is not touching the base of the bowl as this may cause the chocolate to become too hot. If I’m melting chocolate that doesn’t need to be tempered, to go into a cake, or to make a cheesecake or mousse, for example, I may be tempted to use the microwave to melt the chocolate more quickly. But for this recipe, to get a good finish, I strongly recommend against using the microwave. The type of chocolate you use to coat your coffee truffles is a matter of personal choice. I like to contrast the coating chocolate with the one used in the centre. Therefore my preference is to use white or plain chocolate for this, but if you prefer, you could use milk. White chocolate is a little harder to temper as it is much more sensitive to temperature changes and can easily be over-heated. Plain chocolate, on the other hand, is the easiest with milk in the middle. For the truffle centre, please only use milk chocolate. I haven’t tested it with white or plain chocolate so I can’t be sure it will work! Also, do take care when measuring the ingredients with some recipes you can play around with proportions and ingredients to suit but this is not one of them. 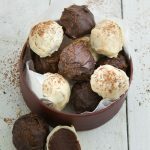 When making the recipe for the blog, I used both white and plain chocolate to coat the coffee truffles and I thought the white chocolate would look particularly nice dusted with a little cocoa powder. When it came to photographing them, however, the dark chocolate truffles did not come out well as they were so dark, so I dusted those with a bit cocoa powder to lighten them a little for the photograph. Personally, I liked the way they turned out, and dusting with cocoa powder has an added advantage – it disguises any imperfections in the finish. Win-win! 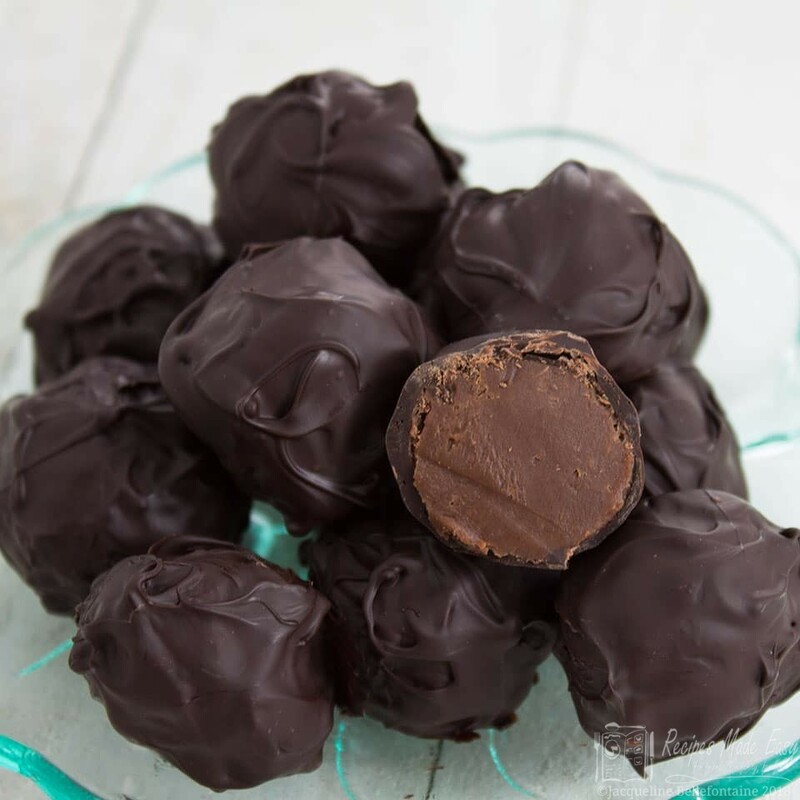 Coffee flavoured truffles with a hint of Kahlua, hand rolled in chocolate. A perfect gift or treat. 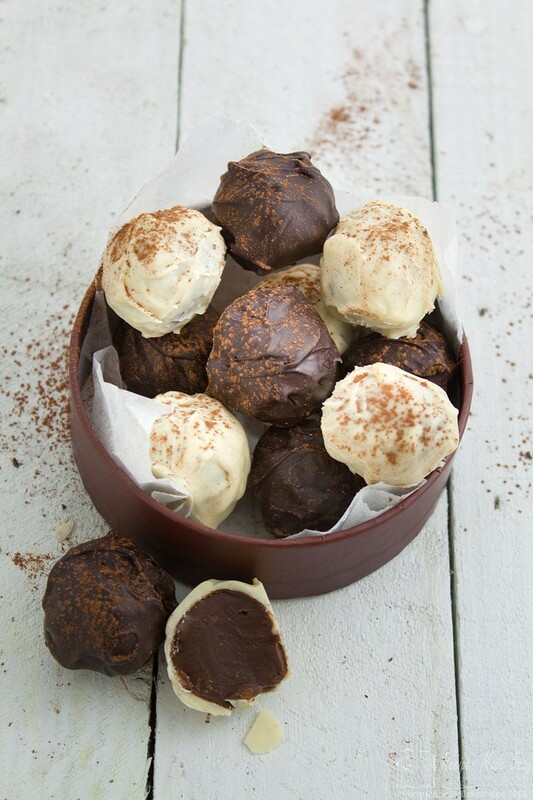 You will need about 1 hour hands on time to make the truffles but remember to extra time for chilling and setting. Line a 900g (2lb) loaf tin with parchment. Break the milk chocolate into small pieces. 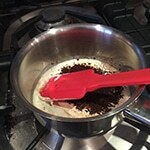 Heat the cream in a small saucepan with the Kahlua and coffee granules over a low heat stirring until the coffee has dissolved and the cream is beginning to bubble around the edge of the pan. 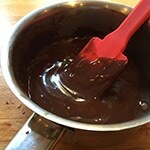 Remove from the heat and stir in the chocolate. 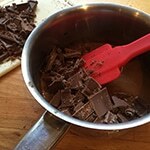 Stir constantly until the chocolate has melted and combined with the cream to produce a smooth chocolate cream (ganache). Immediately pour into the lined loaf tin and allow to cool, then chill for 2 – 4 hours until firm. Remove the mixture from the tin and cut into 24 pieces. Pinch and roll each piece into ball and place on a baking tray lined with parchment. Return to the refrigerator until you are ready to roll the chocolates. To coat the truffles, melt about two thirds of the chocolate over a pan of hot water. Remove from the heat. Add the remaining chocolate and stir continuously until all the chocolate has melted. Dip the fingertips of both hands into tempered chocolate and pick up a truffle. Roll the truffle in a circular movement between your fingertips until coated in the chocolate. Place on a clean sheet of baking parchment. Once all the truffles have all been dipped, repeat the rolling again to add a second, slightly thicker, layer of chocolate. Return to the baking parchment and allow to set. Dust with a little cocoa powder if desired. Heat the cream, kahlua and coffee together. Remove from the heat and add the chocolate. 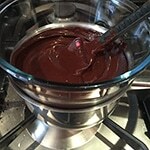 Stir until a smooth ganache is formed. Chill until firm then roll into balls. Temper the chocolate for coating the truffles. Coat the truffles with chocolate. I (and my poor friends who had to taste test them for me) love the coffee flavour of these chocolates. 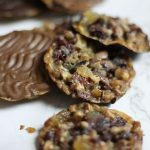 They are seriously good and I would go as far as to say they are the best homemade chocolates I have ever made. And that says something as I have made a lot of chocolates!! But I would love to know, what is your favourite flavoured chocolate truffle centre? I made these for my mum for Mother’s Day. She loves coffee truffles, but does not like white chocolate and unfortunately most of the shop bought ones are coated in white chocolate. These were therefore ideal and she absolutely loved them…..as did my dad, a friend, myself and my children…..basically, anyone that tried them! I am so glad everyone liked them and thank you for taking the time to comment. I do love reading comments from people who have tried my recipes especially if they are as positive as this. i am making these chocs for a xmas present. Instead of setting the ganache in a loaf tin, would it work if i poured it into silicon molds already lined with chocolate? Hi, I’ve made your truffles several times and always come out great! My question is how long will they keep for as the last batch didn’t last long, and can I store them in the fridge. Thank you, for the measurement conversions. You are very welcome. I hope you like them. I will be making them again soon for Christmas pressies. I made these truffles today and it didn’t get firm. I followed the recipe and everything but it just didn’t come out like it should have. Hello Lindsey I am sorry to hear that you had problems making the recipe. The only reason I can think for the mixture not getting firm enough is that there was slightly too much cream or kahlua added so that the mixture has become too liquid. When working with chocolate very accurate measuring is essential to maintain the balance of proportion of chocolate to cream. If that was not the case then inadequate chilling may have been a problem. Im not sure were you are based but if the temperature was high perhaps your refrigerator needed longer to chill the mixture or perhaps it just got too warm again quickly. I do hope they tasted good even if they did not turn out quite how you wanted them. I shall be trying these for Easter weekend – hopefully I’ll receive some of the brownie points that you mention! I hope the wife will like them, and the boy might even get to try one. Do let me know how you get on. If you don’t get brownie points then I shall have to have words with your other half! If you get a moment do pop back and rate the recipe. Brownie points in abundance! The wife and her parents all really loved these chocs, they were very impressed, asked me when I’m going to open a chocolate shop!? What is plain chocolate that you’re referring to? And you say it’s best to use milk chocolate for the inside part, but I’m a big dark chocolate fan, don’t really care for milk chocolate or white chocolate either. So could you use dark chocolate for the inside as well as the coating too? Plain chocolate is the same as dark chocolate, it is the most commonly used term here in the UK although we do sometimes refer to it as dark chocolate too. Yes you could use dark chocolate inside too but i suggest milk as being better, because i feel that it doesn’t mask the coffee flavour too much. Some dark/plain chocolates have very high cocoa content and a strong flavour, but it is really personal preference. You could also try using a plain chocolate of around 50% cocoa solids for the inside and 70% for coating. What is “plain” chocolate? Is that dark or semi sweet chocolate versus milk chocolate? Hi Lisa, Plain chocolate is what we tend to call dark chocolate, here in the UK. I would recommend using a plain/dark chocolate of about 70% cocoa solids. These are rally hard to make I have tried today but it did not turn out as I wanted it to. When I made them there was a big mess probily a bigger mess than what you guys have ever seen. And I have once seen a baby draw on walls and spilled its baby food every were and that did not look to good at alll and I hope the mother of that child cleaned it up or at least got someone to do it. Bit I retried making them and therned out as planned and tasted very good. Does the coffee have to be instant? It is possible to make truffle fillings with water rather than cream in which case you could substitute the cream for strong coffee but I have not tested and the proportions may need altering slightly, so to be sure this worked I would stick to using either instant coffee granules or instant coffee powder, as directed. When you say double cream do you mean heavy Cream? 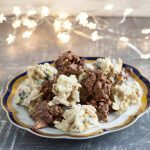 Loving this recipe for a simple Christmas gift idea. Do you have any advice on how long these might keep/store? Or possibly even freeze if I were to make a few weeks prior to xmas? I would not want to make them more than a week in advance. The fresher they are the better they will taste. They would need to ve stored in airtight container in a cool place. They can not be frozen, However I think you could freeze the filling rolled into balls in advance and then coat them in chocolate a day or so in advance. Defrost before rolling and make sure that the surface is dry or the chocolate will seize. I would play safe and use a small bowl of tempered chocolate to roll them in to seal them before coating in the second layer of chocolate. So that if that chocolate gets moisture in and seizes you will not waste all of your chocolate. Hope that makes sense and yes they will make a lovely gift. I cannot wait to try your recipe. 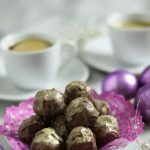 These truffles look like something my mother used to make and we would always be sneaking into the ‘secret’ hiding place to snitch one (or 4) because we could not wait until Christmas to eat them!! Alas, I will be making these for Christmas and I can’t wait to get my hands all chocolatey. I am wondering if you think they would be as good with a Peppermint Mocha Kahlua, as I have a bottle of that from last Christmas. Thank you for sharing your recipe and excellent instructions and photographs. 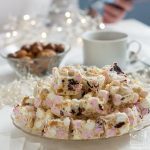 Do you need to add the kahlua, as I would love to make these for my folks, but they are sensitive to alcoholic tastes. Could I leave it out and still get great results? They look super tasty too! yes you could make these without the Kahlua,dissolve the coffee granules in 2tbsp of milk or cream instead. You may want to add a little more coffee granules as well to boost the flavour but that is not essential. I would love to know if you make them and if your folks like them. Another delicious recipe for all of us coffee lovers – coffee and chocolate are truly a match made in heaven. I love that you’ve used Kahlua coffee liqueur as well as instant coffee granules. I completely agree that there’s something extra special about making truffles yourself but you definitely have to embrace the mess! But yes, for those who don’t like getting down and dirty with the chocolate I’ve found that using skewers is a good way to dip them into the chocolate too. However this way there’s always the risk of them falling off into the chocolatey depths. Thank you. The thing i love about rolling them is it so very quick! no ! Thank you…I’m sure I will be back on the food year link up soon. Your ingredients say double cream, what do you mean by that?